Railpictures.ca - Steve Young Photo: This is as much about the main subject as the background. I am not certain about the pattern, but VIA must have been switching and servicing their power as it came through Calgary. This set came off an eastbound “Canadian”, the only train operated with locomotives passing through Calgary at the time. In the background is the turntable and roundhouse that seemed to have little use, except for the switchers. | Railpictures.ca – Canadian Railway Photography – photographie ferroviaire Canadienne. Caption: This is as much about the main subject as the background. I am not certain about the pattern, but VIA must have been switching and servicing their power as it came through Calgary. This set came off an eastbound "Canadian", the only train operated with locomotives passing through Calgary at the time. In the background is the turntable and roundhouse that seemed to have little use, except for the switchers. 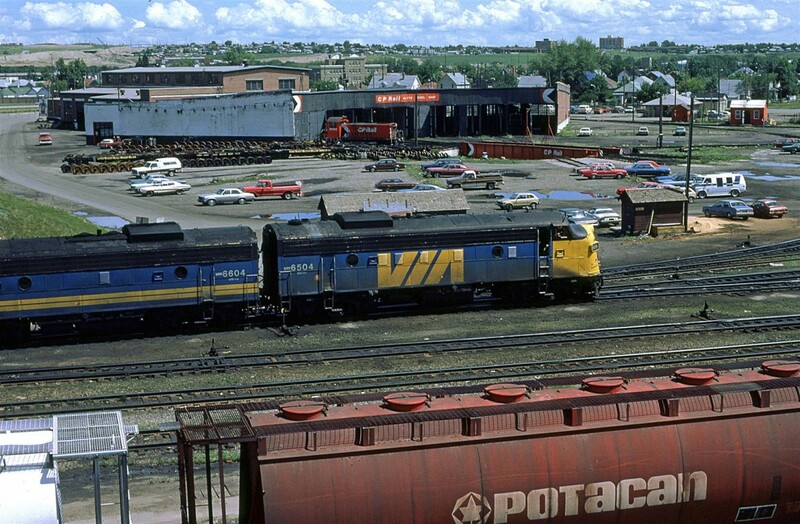 Steve…Calgary was a normal power changing location for passenger trains for a long time. Also, some power was cycled in and out of there is major repairs were needed at Ogden Shops. Kinda looks like a gondola landed in the pit! Cool, I like the multimark turntable.